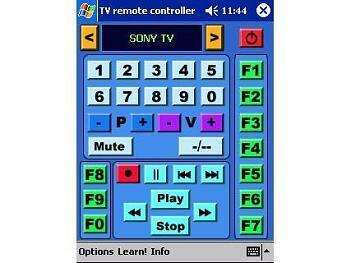 TV Remote Controller is a Pocket PC and Pocket PC 2002 application that uses your PDA as a universal remote control for TV, VCR, Cable, SAT, DVD, and other equipment. You can control 38 predefined devices + 30 learned devices + devices in CCF files. Converts your spoken words into infrared remote control signals using voice recognition technology. Can recognize up to 25 voice commands. Listening in the background (you can use another application and control your TV or VCR). Basic skins: TV, VCR and Universal. Ability to work with CCF files (own skins, macros). Learn mode (you can learn up to 30 devices). Multi-Languages (English, German, Italian, French, and Japanese). Uses PDAs hardware buttons to control volume, program and on/off. Converts your spoken words into infrared remote control signals using voice recognition technology. Can recognize up to 25 voice commands. Ability to work with CCF files (own skins, macros). Uses PDAs hardware buttons to control volume, program and on/off.